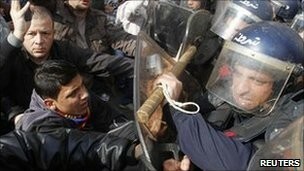 Algeria's Cabinet formally approved an order Tuesday to lift the country's 19-year-old state of emergency. The Cabinet said the order will take effect after its "imminent" publication in the official gazette. It is unclear exactly when this will take place. Earlier this month, Algeria's Foreign Minister Mourad Medelci said the government planned to lift the emergency rules soon. It was one of the changes promised by President Abdelaziz Bouteflika in the aftermath of weeks of anti-government protests. Algerians have been demonstrating over high unemployment and food prices in protests similar to those that led to the recent ouster of the leaders of Tunisia and Egypt. Algeria's military-backed government first imposed the state of emergency on February 9, 1992, the date marked as the start of the country's civil war. It gave the military broad police powers to crack down on Islamist militants who gained support after an Islamic political party was prevented from winning elections a few months earlier. Thousands of people are holding a pro-democracy rally in Algeria's capital Algiers, defying a government ban.